An entertainment mecca located approximately 25 miles southeast of Los Angeles, the city of Anaheim enjoys picturesque views, exceptional weather, and a bustling economy. Home to the largest industrial district and the second largest business park in Orange County, Anaheim businesses include a number of major corporations: AT&T, Banco Popular, General Dynamics, Hewlett Packard, Izusu, Kaiser Foundation, Panasonic, Fisker Automotive and more. Of course, the most famous business in Anaheim is Disneyland Park (although Disney’s corporate HQ is elsewhere). In 2010, Anaheim was home to approximately 336,255 people, which makes it the most populous city in Orange County – and it’s still growing. Thanks to rapid development throughout the city, including in the Platinum Triangle and in Anaheim Hills, the city fully expects to pass 400,000 residents by 2014. With its close proximity to the Pacific coast and the mountains, and its outstanding resorts and theme parks, living in Anaheim means never running out of things to do. Famous as a resort town and tourist destination, Anaheim boasts innumerable shopping and dining options for every budget and taste. The Downtown Disney complex, located next door to Disneyland, features 330,000 sq. ft. of retail shops and restaurants, including the Rain Forest Café, House of Blues, and Ralph Brennan’s Jazz Kitchen. The Shops at Anaheim GardenWalk offers fine dining and boutique shopping in an oasis of scenic waterfalls and manicured gardens. There’s even a state-of-the-art movie theater and an upscale bowling lounge. Just across from the Honda Center is JT Schmidt’s Restaurant and Brewery – a favorite for handcrafted microbrews, steaks, pasta, pizza, and more. The Westfield MainPlace Mall in nearby Santa Ana is home to all your household favorites: Abercrombie & Fitch, Aldo, American Eagle Outfitters, Bath & Body Works, The Body Shop, Charlotte Russe, Eddie Bauer, Express, and more. With a variety of theme parks and 46 city parks, the city of Anaheim, CA is well known for its recreation. Tourists from around the world come to enjoy Disneyland and the recently opened Disney California Adventure Park, as well as several other attractions operated by the Disneyland Resort. Each week, more than 6,000 skaters take the ice at Anaheim Ice, the city’s public ice rink. The Pearson Park Amphitheater features seasonal entertainment throughout the summer with its Summer Nights Under the Stars event. Sports fans also love Anaheim! The Los Angeles Angels of Anaheim play to more than three million fans each season at Angel Stadium. In addition to its beloved baseball team, Anaheim also is home to the NHL’s Anaheim Ducks (formerly “The Mighty Ducks”). The team plays in the city’s Honda Center. Want to hit the beach? Anaheim is only 13 miles away from the Pacific coastline, where you can swim, surf, and relax under the sun nearly any day of the year. Prefer to hit the slopes? Hop in your car and head east. Several mountain resorts with skiing, snowshoeing, and more are just a short drive away. Despite its world-famous reputation as the home of Disneyland, the city of Anaheim has a lot more going for it than just its theme parks. From the Anaheim Ballet to the Chance Theatre, city residents can get their fill of live entertainment almost any night of the week, and the changing exhibits and world-class presentations at the MUZEO arts museum are always a delight. There are also a number of citywide events that take place in Downtown Anaheim, including the Farmer’s Market and Craft Fair, the Art Crawl, the Historical Anaheim Antique Flea Market, and the 5K Run. Homes for sale in Anaheim range from luxury estates in the master-planned community of Anaheim Hills to historic homes in the mixed-use neighborhoods of Downtown and high-rise condos in the Platinum Triangle, a redeveloped, neo-urban district surrounding Angel Stadium. Median home price in 2011 was $409,100. The children of Anaheim are served by eight public school districts, including the Anaheim City School District and the Anaheim Union High School District. The El Rancho Charter School is a public middle school in Anaheim well known for its high academic standards. 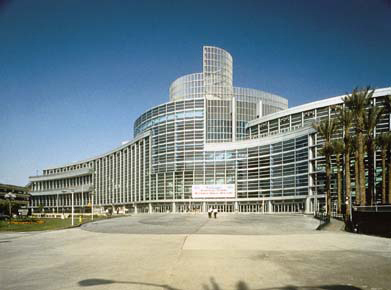 The city of Anaheim features a number of high quality medical facilities, including the Anaheim Regional Medical Center and the West Anaheim Medical Center. For transportation, the Anaheim Amtrak station is located near Angel Stadium and serves as the area’s major train station, while the Anaheim Canyon Metrolink station connects commuters to Los Angeles and the rest of the Greater Los Angeles region. The John Wayne Airport connects Anaheim with almost any destination in the world.